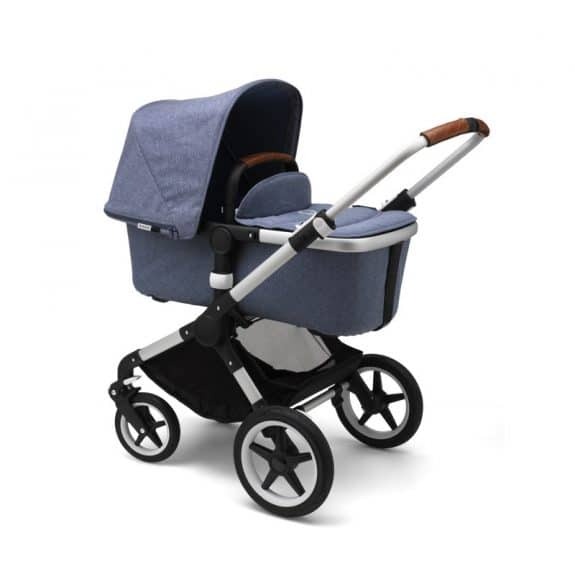 bugaboo is very known for their stylish, well-designed stroller. A line that was created for urban parents who wanted to stroll with their babies everywhere has grown into a collection of products for parents of all lifestyles. 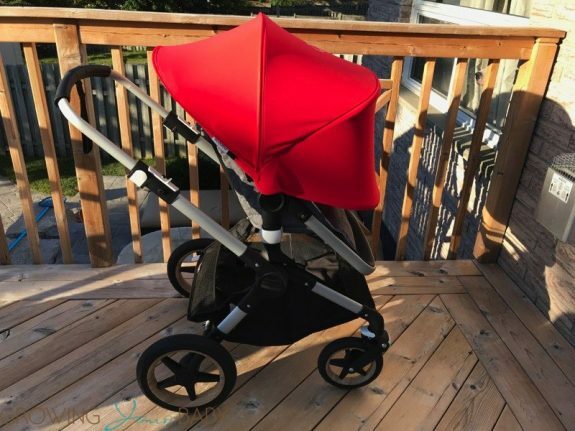 The New Fox keeps bugaboo’s sleek design but adds in features for those who are looking to take a full-featured stroller anywhere. From birth parents can use the stroller with the included stroller seat, with the additional bassinet or with your infant car seat. Additional adapters will be needed to use your car seat with the stroller. The stroller’s seat will hold a child from birth to 48.5lbs. 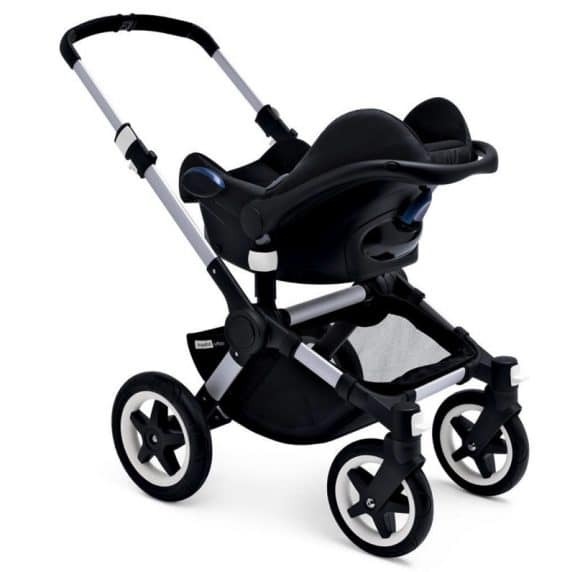 It features bugaboo’s comfort harness that is both easy to adjust and fit for your child’s size. This harness is one of my favorites of all the ones I have seen on any stroller. 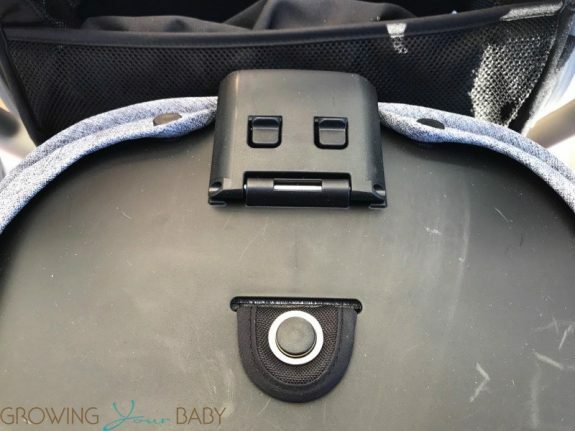 It is designed in a way that it hugs your child so they don’t mind being buckled in. It can be adjusted as your child grows by moving the strap up or down the track at the back of the seat. To accommodate kids of all ages(and moods) the seat can be reversed and it reclined flat for a sleeping baby. Our seat is the grey melange and it offered a nice padded ride for kids of all ages. When your child is a toddler their feet can rest in the footwell. As they get older their feet will dangle as you stroll. 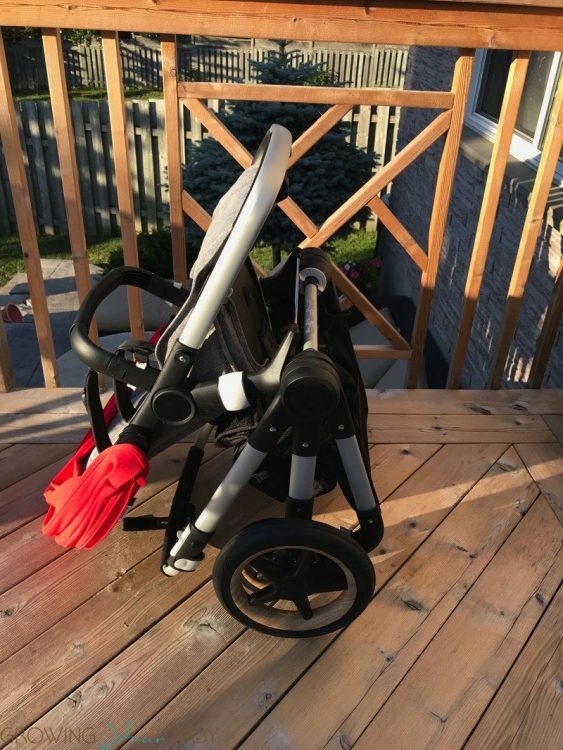 bugaboo also includes a bumper bar that can be pivoted in either direction when your child wants out. For me, this doubles as a carrying handle when I need to get the seat in and out of the car. The canopy on the Fox is a 2-panel shade that can be expanded by an extra canopy length during a hot or rainy day. The push on the Fox is reeeeaaallly nice. This is thanks to a dual suspension system. bugaboo has added central joint suspension & front wheel suspension to help absorb any bumps from uneven terrain or bumpy sidewalks. The result is a stroller that pushes easily almost anywhere. 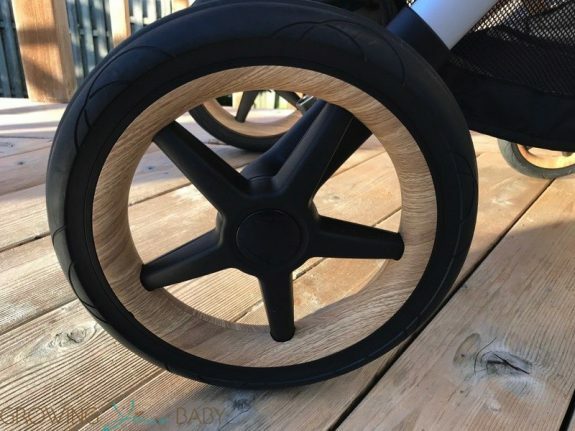 bugaboo also uses a wheel combination of 8.5 inches in the front and 12 inches in the back to allow the stroller to move most terrains with ease. bugaboo offers a couple different wheel styles on the Fox. Ours came with a wood look and I really liked it. It gave the stroller a unique look that I haven’t seen on other buggys. The brake on the back can be activated and released easily. 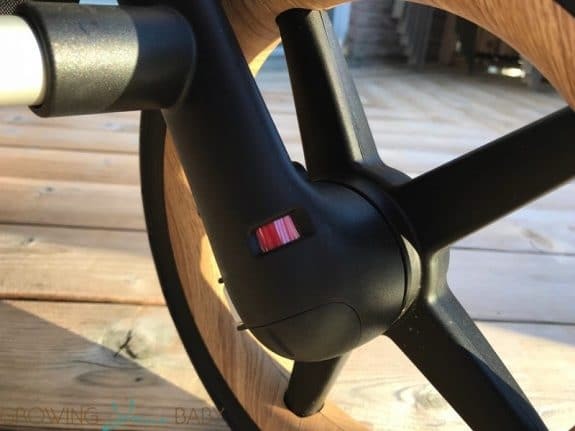 There are windows on the back of the wheels that change to red if it’s locked. I like that it’s just one lever both wheels. Quick and easy! The front wheels can also be locked for bumpy terrain. Perfect for parents of all heights, the handlebars on the Fox can be adjusted to 11 different heights. 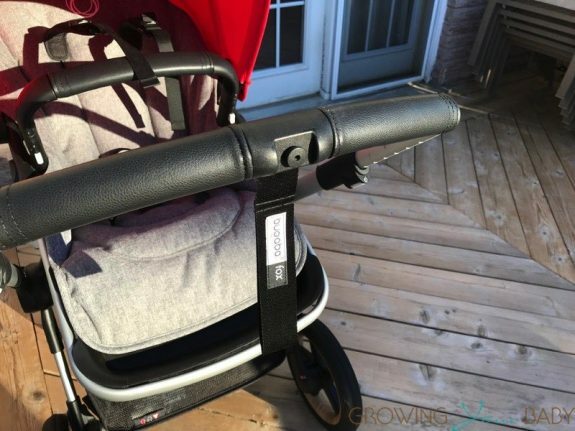 bugaboo has also added a strap to ensure the stroller doesn’t get away from you if you’re pushing it downhill. The storage under the Fox is spacious and reinforced so you can pack it up without worrying about the basket dragging. bugaboo says it holds 22lbs. We love that it holds our massive backpack with room for jackets, snacks, and market finds. Re-inforced panels on the bottom ensure it doesn’t drag and mesh along the sides allows it to be packed up. There is also a pocket in the storage basket you can use to store smaller items. The fold on the Fox is convenient and compact. When in the seat is in the forward facing mode the stroller can be folded with it on. 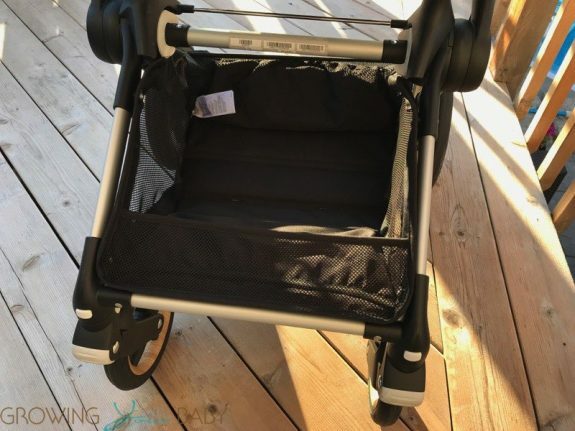 The stroller can also be folded when the seat is facing the parent, as long as the seat is adjusted to be parallel with the bars. 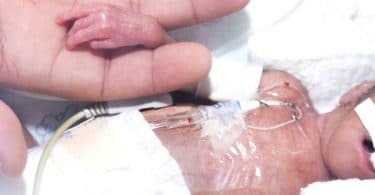 To further reduce the size of the package you can remove the seat and flatten it by unclipping the lever under where the baby’s bum would be. I personally don’t ever fold a stroller with the seat on. I fit it cumbersome to open up when you are getting it out of the car so I prefer being able to fold the seat down more when it’s off the frame for more room in the trunk. Without the seat on, the chassis does fold to be a little more compact. This, along with the flattened seat, allows it to fit more easily in small spaces. 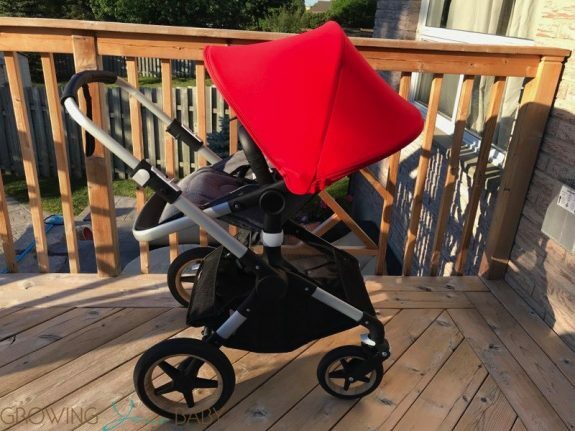 The bugaboo Fox is a beautiful full-sized stroller that is perfect from birth to 6+. Its ability to go over a large number of terrains makes it ideal for urban and suburban families, while it’s many strolling options all you to use it from birth and beyond. 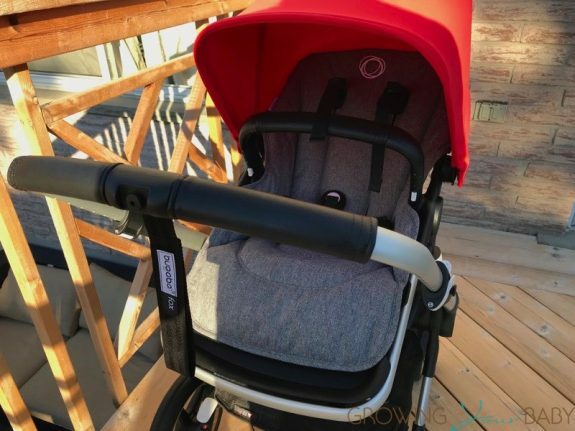 bugaboo has also created a large number of accessories for their entire line to allow older kids to stroll with their siblings and keep little ones extra comfortable under all weather conditions. 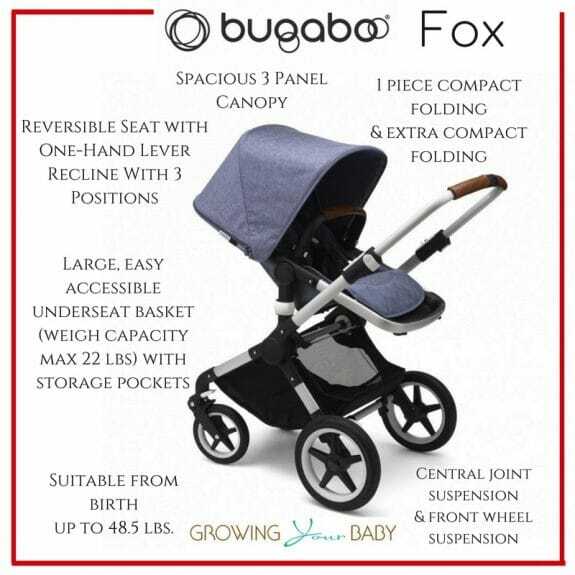 Please visit bugaboo.com for more details on the Fox.